Cancer. Car accident. Old age. Pneumonia. Diabetes. Internal bleeding. Liver failure. AIDS. There are so many ways to die. None of them make it pleasant for those who are left to mourn. And I don’t mean to belittle anything that anyone has been through, but I do want to say that there is one way someone can die that is quite different from the rest. Most people never lose someone in this manner. Those who have are never the same. Someone died, not because they or someone else was drinking and driving. Not because someone ran a red light. Not because the medicine didn’t work. Not because they decided to end their own life. Not because they lived an unhealthy lifestyle. Murder is when someone dies at the hands of another. On purpose. October 5, 2005. A morning that shook me so much that it changed the course of my life. Someone I knew was shot and killed. It actually happened the night before, but it wasn’t until I got to work the next morning that I heard the news. As a sports reporter for the local paper, it wasn’t unusual to get to the office and receive a phone call from a coach. But this was a phone call I would never forget. Let me back up a little bit. I moved to LaGrange, Georgia in 2004 a month after graduating from Indiana University with a degree in Journalism. I began working for the LaGrange Daily News as a general assignment reporter, but within a few months I was a sports writer, which was what I wanted all along. I was covering Georgia high school football, and if you know anything about football, you know Georgia is right up there with Texas. High school football is king. What basketball is to the Hoosier state, football is to the Peach State. There were three main high schools with football teams. LaGrange, Callaway and Troup. LaGrange was the powerhouse. Handfuls of seniors signed at Division I colleges every year. Handfuls of former Grangers were playing in the NFL. At the time, the team was ranked No. 1 in the nation. While I loved the kids and coaches there, for some reason my heart was at Troup. They were the underdog, often carrying a chip on their shoulder for always being in the shadows of LaGrange. The Troup kids were different. To an extent, they were friendlier. I became close to the Troup players and coaches because after I’d interview them, the conversation would continue. They’d ask about my life, how I was doing, if I was homesick, what I thought of the Colts game. I always felt welcome at Troup practices and games. The coaches and players became like family to me. It was like I had a bunch of new big brothers, and an entire football team of little brothers. 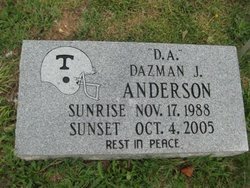 One such “little brother” was Dazman Anderson. He was injured up until October. And finally, FINALLY he was in condition to play starting quarterback again. This was huge news not only for Troup, but also for the many Division I colleges recruiting Daz (as he was often called). A rough home life wasn’t going to stop Daz from reaching his dreams. He was overcoming his situation. He was doing things right. His life was taken from him on the night of October 4, 2005. A good friend of mine and coach from LaGrange called me at work the next morning. My stomach turns into knots just thinking about it. It’s a phone call you never, ever think you’ll get. The phone call that someone you know was shot. 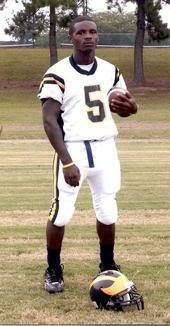 I can still hear Coach Veal’s voice, as he asked me if I had heard about the Troup football player who was shot. I almost laughed it off, and my first thought was that someone was messing around with a gun and shot themselves in the foot. But then it got real. I didn’t believe him. I told him he was lying. It just wasn’t possible- I had just talked to Daz the other day. I had just seen him the night before at a volleyball game, apparently just a few hours before he was killed. But it was true, and it shook an entire county. It shook me. It forever changed me. It forever scarred my heart. According to court documents and witnesses, Dazman was trying to break up a fight between his sister and her boyfriend, which turned into a fight between Daz and the boyfriend. The boyfriend pulled out a gun. Daz ran. He was shot in the back. That’s the part I can’t live with. That’s the part that makes it impossible for me to let it go. Dazman was shot in the back. He was running away from a situation that could have ended right there with his departure. But it didn’t. Terry Hubbard made the decision to shoot a 16-year-old in the back and take his life. And not just any 16-year-old, but one with a bright future, one who was succeeding in life despite the fact that life wasn’t easy for him. Dazman was a good kid. Any of his teachers and coaches would tell you that. The funeral of someone who was murdered is a mystical thing. The funeral of a 16-year-old is devastating. The funeral of a murdered 16-year-old is hellacious. It’s unbearable. I watched from the balcony of the church where I stood with our reporter who was writing a story on it. News stations from Atlanta were there. It was a big deal. A big, ugly, heartbreaking deal. I will never forget the scene. An open casket holding the body of a murdered kid. His teammates, all in their football jerseys, sitting and crying together. His mother, escorted by nurses in case she fainted. I wrote a column about the terrible ordeal. I wrote multiple articles about how it impacted not only Troup High, but LaGrange and Callaway as well. Troup County is a fairly small community, and everyone was either related or knew each other. The death of Dazman destroyed the entire county. I got even closer to the kids after Dazman’s death. Some really opened up to me about their feelings. 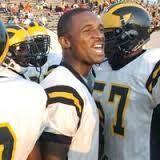 I spent a lot of time at Troup High School talking with his teammates, coaches and teachers. Although in the middle of a tragedy, I realized that school was where I wanted to be. I wanted more time with kids, to be there for them, to maybe even change a few lives. Some of you know the rest of the story. By spring I had enrolled in the graduate program at LaGrange College, and by that next fall I was a fulltime teacher at Troup County Comprehensive High School. My life as a sports writer was over, but this was much more fulfilling. I taught at Troup for two years before moving back to my home state of Indiana, where I taught for four more years. And last year, I taught high school English at an international school in Uganda. It’s clear that Dazman’s death was so much more than just a heartbreaking experience for me. It was a life changing one. October has always been my favorite month. It’s my favorite weather and my birthday is the 22nd. But I’ll never forget Dazman or the day he died. I’ll certainly never forget the impact it had on my life. Who wins in the “my life is harder” competition? Everything about what happened that night is from a public document, which you can find online, on Hubbard ‘ s trial, which is why I stated that in the post. Everything else is my personal experience. Therefore it is not fiction. Are you seriously calling facts that happened fiction? This was a personal account of how it changed her life. It was certainly not “fiction” from any aspect. And for the record, saying “everything happens for a reason” is a thoughtless and rude platitude to anyone who has lost someone through violent means. You are so right, Holly. I despise that phrase – so often the “reason” is that someone made a very bad decision or committed a heinous act of violence. It offers little consolation to someone struggling to understand the loss of a loved one. I knew Daz, he went to high school and was friends with my daughter – he was a delightful young man who had a smile that stretched for miles. Thanks to the author for reminding us of him. Like i stated before it was a sad situation all the way around but everything that’s printed in the paper is not always 100% true. It’s over and done so it is what it is. Be Blessed ladies! Found my backbone. Can I give it back now?